Thrifty and Frugal Living: Harvey Prince Ageless Giveaway (3 winners)! Harvey Prince Ageless Giveaway (3 winners)! Harvey Prince is a company that was founded by two brothers as a gift for their mother on Mother's Day. Ageless was their first creation. They created it for their mother to capture her effortless and radiant aurora. Now, smell as young as you feel. Inspired by scientific research and crafted with love, Ageless by Harvey Prince defies your skin’s natural age-revealing scent. Its notes are an inviting blend of pink grapefruit, pomegranate, luscious mango, with a dry down of jasmine and natural musk. 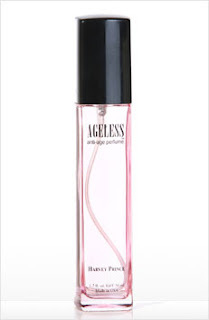 Here's the secret: Ageless is inspired by recent studies conducted by the Smell & Taste Treatment and Research Foundation in Chicago, which find pink grapefruit and mango to be the olfactory antidote to aging. The fragrant notes disguise the familiar scent of age, caused by the breakdown of particular fatty acids in your skin. Women from around the world are loving Ageless; based on their testimonials and our own trials, Ageless makes you feel and smell 8-12 years younger. Notes: Pink Grapefruit, Pomegranate, Mango, Jasmine, Tuberose, YlangYlang, Sandalwood. Are you excited? I am! Good luck everyone! Make sure you keep an eye out for my review in the next few weeks.